This place is also kid-friendly, as they also have toys and even seats for the little princesses. 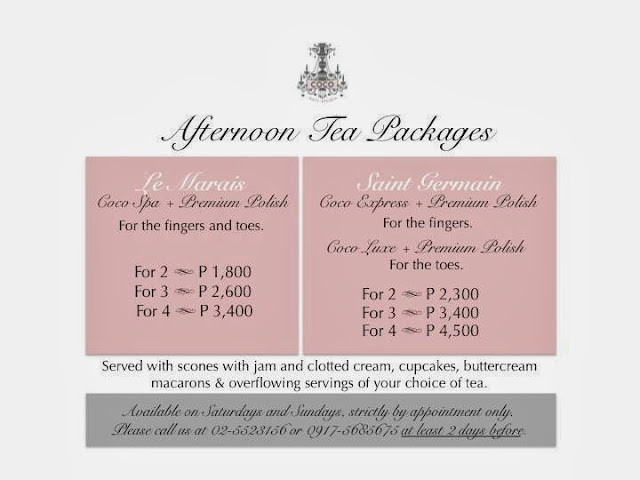 For our treatment, Jeng and I tried the Saint Germain Afternoon Tea Package (Php 2300 for 2). The package includes Coco Express (nail cleaning) + Premium Polish for the fingers and Coco Luxe (soak, sea salt scrub, massage, paraffin, nail cleaning) + Premium Polish for the toes. Included in the package are scones with jam and clotted cream, cupcakes, buttercream macarons and overflowing servings of tea (hot or cold). Thank you so much, Ms. Gigi Uson, for having us. We really had a great time! And thanks a lot to Mama Bear for a day full of joy and laughter. Hope to see you again soon!